The Adria Sandal from Birkenstock has gotten lots of attention across the web, so I decided to review the popular Birkenstock release. After digging up the dirt on this sandal design by reading through countless reviews and product information, I can say that you might be better off spending your money elsewhere. While the concept for the sandal-slash-flip-flop may have seemed like a good idea on paper, I feel like Birkenstock made a few hits and misses with the overall execution of the Adria design. 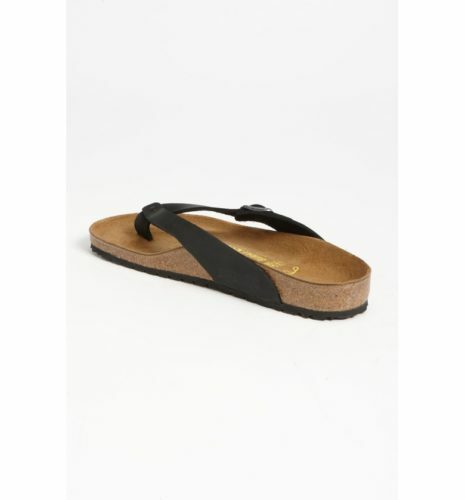 Sadly, it doesn’t really feel or perform like their more impressive women’s sandals like the Gizeh Thong Sandal which is a top rated sandal-thong hybrid from the same brand. Clumsy and flimsy, the Adria isn’t something I can highly recommend, but it still might fit some buyers’ fancy. Learn more about this sandal and why it turned out to be just an okay choice by reading through what I learned with my research. Birkenstock prides itself in its comfy casual aesthetic that leverages soft curves and earth tones to give you a footwear choice that you can use on the daily. While some elements of their signature design remain the same with the Adria, it just doesn’t really hit the right notes in terms of looks. Firstly, the Birko-Flor strap used for the standard Adria design uses a polished finish that makes it look almost like a plastic flip-flop thong. The way the strap converges over the toes is another problem. With two segments of the strap coming together from either side of the footbed, the strap portion along the inner-side of the foot twists awkwardly to meet the other. This essentially leaves it at an angle that doesn’t really look very neat or ergonomic. This also prevents the straps from laying flat against your feet during use. Not only does it become an aesthetic issue, but it also gives rise to a few comfort problems. If there’s anything we love about Birkenstocks, it’s that they’re incredibly comfortable. They use a scientific approach for designing their sandals and flip-flops, and almost always come up with options that cradle the feet for maximum comfort. The same can’t be said with the Adria unfortunately. The straps which I previously discussed dig into the skin because of the awkward twisting. 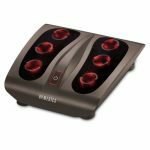 The edges of the polished Birko-Flor can be very uncomfortable, causing serious friction and blistering over the top surface of the feet which tends to be much more delicate than other areas. 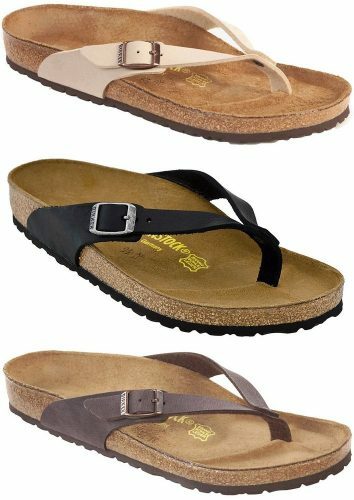 The footbed and sole feel a lot stiffer compared to other Birkenstock sandals. They’re also significantly heavier, despite the company claiming to use the exact same material and construction design. Basically, these differences make the sandal a pain to walk in. Extended use can cause sore skin and tired arches due to the sandal’s overall weight. It’s also worth mentioning that because the straps are made from polished Birko-Flor, the portion that sticks between the toes can cause some serious sweating. 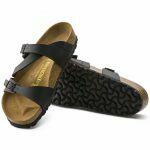 Despite having the same contours over the footbed, it seems the Adria Sandal can’t really provide the same satisfying support that other Birkenstock sandals offer. We found this to be mainly because of the flimsy straps that can’t hold the foot properly in place during movement. What happens is that the foot tends to leave the areas of the footbed which are intended to cradle it. In the long run, this can cause pain in the arches. 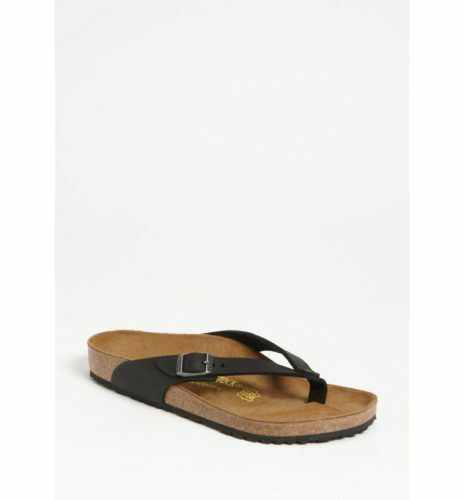 It also seems that the cork footbed is a lot less forgiving of movement compared to other Birkenstock sandals. This restricts a lot of natural foot movements, making the sandal really unpleasant to walk in for extended periods. Durability wise, it seems the thin sandal straps are also a major problem. Because the sole and footbed are a lot heavier, the straps can’t hold the entire thing together for long. Wear and tear to the narrowest portion of the straps can cause them to break and rip over time. Plus the fact that a single plastic rivet holds the two parts of the strap together. It’s really not hard to see why they can be so easily broken. 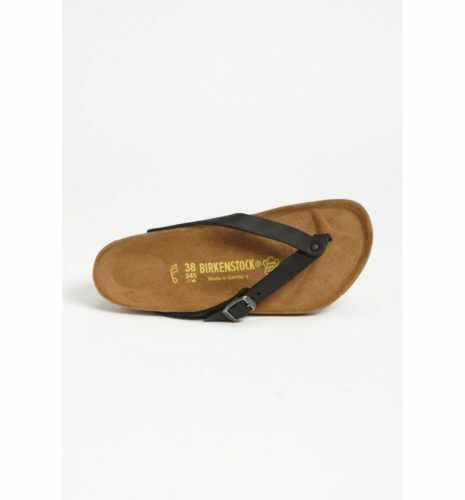 Other than that, the footbed and insoles feature the same durable design used by other Birkenstock sandals. They can last for decades without showing signs of wear and tear, and are particularly effective at resisting odors, stains, and damage. Had the straps been more resilient, the entire sandal may be able to last you long years of use minus the worry for broken parts that need replacement. It’s no secret that the treads on a fresh pair of Birkenstocks can wear out after just a few months of use. With the Adria, the company didn’t really make any changes to the tread design, so you can expect pretty much the same thing. The outsole treads can wear out pretty easily especially because of the weight of the sandal itself. Using the sandal daily on even just smooth surfaces causes significant wear on the treads. Fortunately, Birkenstock seems aware of the problem so they do offer sole replacement and repair services for a reasonable cost. In my opinion though, as the entire cork footbed and insole can last for years, it seems counterintuitive to keep using the same EVA outsole for their sandals. This is especially because the brand already seems to know how it tends to wear away. If there’s one thing I can call a positive characteristic, it’s that the Adria sandal does come in a variety of colorways. The design is available in more colors and strap textures, mainly because the company advertises it as a summertime flip-flop. So this gives buyers more options to match with colorful summer clothing and beachwear. In my opinion, it would be much better off to purchase the Adria in the typical texture Birko-Flor material. This is because compared to the polished nubuck leather, it is a lot softer. This reduces the amount of time you’ll need in order to break-in the straps so you can get at least a little more comfort out of their use. 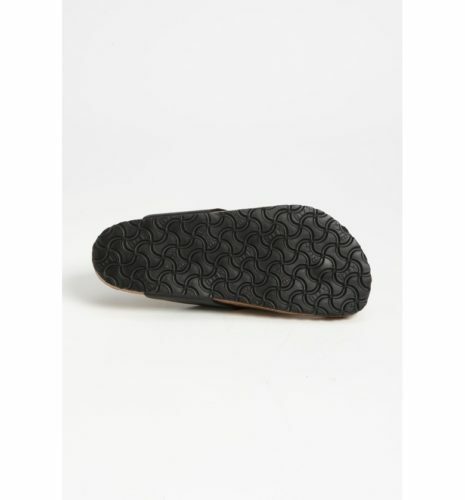 Contoured footbed designed to cradle the feet and provide proper support for different foot shapes and sizes. Durable insole and footbed can last decades without showing signs of wear and tear. Lots of colors and strap textures to choose from. So you can best match your Adria with your summer clothes of choice. Straps are too narrow and flimsy to last for long without completely ripping or breaking. Poorly positioned straps cause the edges of the leather to dig into the top surface of the foot. 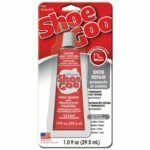 This causes uncomfortable friction and the possibility for blisters. Polished nubuck leather uppers are not comfortable to have between the toes. Straps too flimsy and loose to properly hold the foot in place. 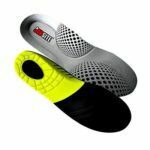 Heavy sole construction can cause unnecessary fatigue. Traction is substandard and unimpressive, losing grip after just a few months of use. Unforgiving cork footbed doesn’t bend or flex to accommodate movements of the feet. Aesthetic feels lacking and forced, not appearing as pleasing as other Birkenstock designs. As much as I wanted to speak highly of the Birkenstock brand, there’s no choice but to accept the fact that there will always be hits and misses when it comes to footwear designs. This remains true no matter how prominent a brand might be. In the case of Adria, it seems that the brand made a lot of misses. Most of its features and characteristics make the sandal an overall poor performer. From its flimsy and awkwardly designed straps, to its heavy sole, and even its general appearance. At the end of it all, there’s a lot of room for improvement for this summertime sandal. So is the Adria worth the purchase? In my opinion, you might be a lot better off checking out other sandal-thong designs from Birkenstock. That said, you may want to give the Gizeh Thong Sandala closer look. 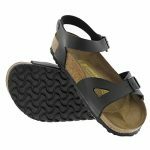 This design should help you find out just what a reliable, durable, and comfortable pair of Birkenstock sandal-thongs really look like.